Fresh off a new 8K filing, Norstra Energy Inc (NORX) had its first day of volume today trading 131,800 shares. The volume was supported by a press release by the company announcing the appointment of a new CEO, Glen Landry. NORX is a fresh ticker that only just filed to go public in April of 2012 meaning this ticker is on the fast track for something. To find out exactly what we will need to take a much deeper look at the ticker. Nostra Energy Inc was registered as a Nevada business entity on November 12, 2010 as Nostra Inc.
On November 18, 2011, the name of the entity was changed to Nostra Energy Inc. In February of 2012, Nostra Energy Inc issued 20,256,550 (pre-split shares) at a price of $.001/share for total proceeds of $20,257. On March 28, 2012, still prior to filing to go public, Nostra Energy Inc did a 2:1 forward split. This brought the total outstanding share count to 40,513,100 shares. Dallas Kerkenezov (CEO, president, treasurer, secretary) now owned 30,513,100 shares costing $.0005/share. Sasha Heredia (director) now owned 10,000,000 shares costing $.0005/share. Prior to filing to go public, Nostra Energy Inc signed an Oil & Gas Lease agreement with Keta Oil & Gas Inc. For the sum of what appears to be $10.00, Nostra Energy Inc acquired control of a 40 acre claim in the state of Kansas. In this lease agreement, Nostra Energy Inc used an address in Norway - Madlastro 11 Hafrsfjord 4045 Stavanger, Norway. In later NORX filings, NORX would list the acquisition cost of the property at $15,000. The claim has been name The Lerado Extension Prospect. The Oil & Gas Lease agreement doesn't show anybody signing for Keta Oil & Gas Inc. It just gives us 1 name. The name of the Notary, Bob Herndon. A little research doesn't reveal any Keta Oil & Gas Inc, but there is a Keta Oil & Gas LLC incorporated in Kansas on September 27, 2011 by the very same Bob Herndon (aka Robert Herndon). By the time that Nostra Energy Inc filed to go public, it was using a Texas address at 414 Manor Road Laredo Texas, 78041. A Webb County records search discloses the owners of 414 Manor Road Laredo, Texas as Juan Francisco Trevino and Jennifer J Featherston. I cannot be 100% sure it is the same Juan Francisco Trevino, but there was a Juan Francisco Trevino (aka Kiko Ozuna) from Laredo arrested and convicted of intent to distribute more than 1000 kilograms of marijuana from Laredo to Dallas where it was to be distributed further from there. See the court documents for the conviction here. Juan Francisco Trevino was sentenced to 22 years in prison. Here is some information about Juan Francisco Trevino's brother, Miguel Angel Trevino Morales and his role in a powerful Mexican drug cartel. The city of Laredo, Texas issued an arrest warrant for Miguel Angel in November of 2007 in connection to a 2006 double homicide. Miguel Angel is also wanted for conspiracy to manufacture and distribute cocaine into the United States. To date the authorities have yet to catch up to Miguel Angel. He remains free and wanted. There was actually an interesting article posted on June 12, 2012 about Juan Francisco Trevino's younger brother and other family members being involved in using drug smuggling money to purchase race horses as part of a money laundering scheme. According to this article as of June 12, 2012, Juan Francisco Trevino remained incarcerated putting some doubt into the possibility of this drug trafficker and his power drug smuggling family being linked to the NORX shell. At this point we will have to just assume there is no connection at all. Dallas Kerkenezov is from Norway, but has also spent time in Canada. Dallas Kerkenezov has experience in the oil & gas industry through his construction company, Rom for Bygg. Sasha Heredia is from Venezuela where he was a petroleum engineer. Bob Herndon is the control person for Keta Oil & Gas LLC, the company that sold the oil & gas claim to NORX. There isn't a lot about Bob Herndon out there, but there is a Bill Herndon who controls a company called Tiger Oil & Gas LLC which shares the same address as Keta Oil & Gas LLC. Tiger Oil & Gas LLC sold some oil & gas claims to Black Hawk Exploration Inc (BHWX) in October of 2010. Black Hawk Exploration Inc (BHMX) is directly linked to Tiger Oil & Gas Inc (TGRO). TGRO/BHMX are both tickers controlled by Kenneth B. Liebscher, Howard Bouch, Kevin Murphy and their group. This group can also be linked to several tickers including NGRC, DEWM, NTEK, UPCO, FHAI, NHUR, and others. Learn more here. TGRO, BHMX, and NGRC all became promoted tickers. The S-1 to go public was filed on April 30, 2012. Nostra Energy Inc had $177 cash and the oil & gas claim which they valued on the books at $19,064. No revenues. The S-1 was made effective on July 12, 2012. Immediately after the S-1 was approved, Nostra Energy Inc sold 33,250,000 shares for $.001/share to a group of seed shareholders raising $33,250. This made the new outstanding share count 73,763,100 shares. NORX was going through cash fast and making no noteworthy progress with its oil & gas lease. On February 27, 2013, NORX signed a promissory note agreement with Jackson Bennett LLC for $100,000. The Note bears interest at 10% and has a maturity date of February 27, 2015. The Note together with the interest may be converted into shares NORX stock at a conversion price of $.25/share. Jackson Bennett LLC is a Nevis business entity. Signing for Jackson Bennett LLC was Ariel Sta. Cruz who is probably just a nominee officer being used so that the actual owner of the shares that go to that entity can remain anonymous. This is not Jackson Bennett LLC's first time signing owning equity or debt in a penny stock. On July 21, 2012, Jackson Bennett LLC issued a $40,000 convertible Note to Petrosonic Energy Inc (PSON). To date there has been no disclosure as to whether or not Jackson Bennett LLC has converted that note, but like ORYN, PSON has some shady debt agreements, and like ORYN, PSON ended up getting promoted starting on December 11, 2012 and ran from $.56/share to over $1.00/share. Today, NORX filed an 8K announcing that Dallas Kerkensov and Sasha Heredia both resigning and Glen Landry became the new president, CEO, secretary, treasurer, and director of NORX. Dallas Kerkensov will remain on board as the CFO. According to his bio in the 8K, Glen Landry is a seasoned exploration geologist of 40 years. During the 1980s he was President of Western Reserves, a Billings, Montana company engaged in exploration and production of oil and gas. The company was involved in a number of successful joint ventures as well as property acquisition of over 150 wells from Texaco. During this time he was also engaged by Occidental to undertake exploration work on claims in northwest Montana. After resigning from Western Reserves, Mr. Landry was again active as a consulting geologist for companies such as Apache and EnCana. Since 1997, Mr. Landry has been an independent exploration geologist and has been undertaking exploration and development work of a large number of oil and gas concessions throughout Montana. His focus has been on underdeveloped Alberta Fairway Bakken properties as well as heavy oil reserves in northwest Montana. There is no doubt that Glen Landry is well connected in the oil & gas industry throughout the penny stock world. Through his entities Longshot Oil LLC and Four Bear Heavy Oil LLC, Glen Landry signed agreements with SEC suspended ticker Uniontown Energy Inc (UTOG) and Stellar Resources Ltd (SRRL). Glen Landry was also the long time main insider for Juma Technology Corp (JUMT). All three of those tickers, UTOG, SRRL, and JUMT are battered, abused shells. Glen Landry has an interesting connection to Luis Carrillo. 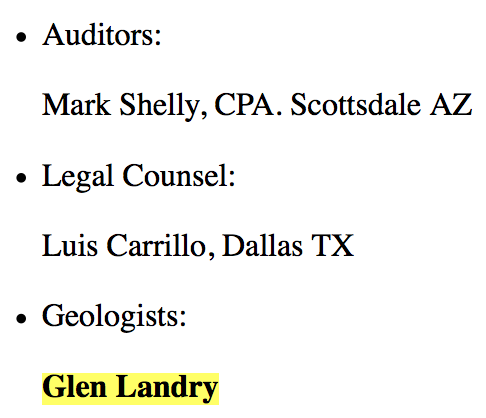 Glen Landry is/was the geologist for Armont Energy Inc. Armont Energy Inc used Mark Shelly as its CPA and Luis Carrillo as its legal counsel. The Nostra Energy Inc website can be found here. NORX is a very interesting ticker. We have a pretty basic looking set-up that suggests possible future p&d type action. We have seed shareholders with 33,250,000 shares of stock that are now free trading. We have a new CEO with a long history with penny stocks. We have a toxic foreign financier that has been involved in 2 other tickers that both ended up getting promoted. With the sudden volume today, NORX should definitely be kept on close watch moving forward. As always very impressive work, thanks for all your hard work and valuable information.